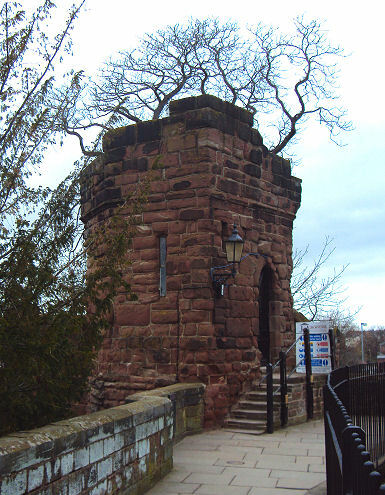 Medieval Bonewaldesthorne's Tower is situated on the north west corner of Chester's City Walls and is attached by a spur wall to the Water Tower. The tower is a Grade I listed building. The tower is rumoured to have been so named after an officer in the army of Aethelflaeda, Lady of Mercia, the daughter of the Saxon king Alfred the Great. Aethelflaeda rebuilt Chester's walls during Saxon times around 907 A.D. extending them to the edge of the river on the South and Western sides of the old Roman fortress, to establish Chester at the centre of a line of burghs, stretching from Rhuddlan in North Wales to Manchester, to protect the northern frontier of the tribal kingdom of Mercia. 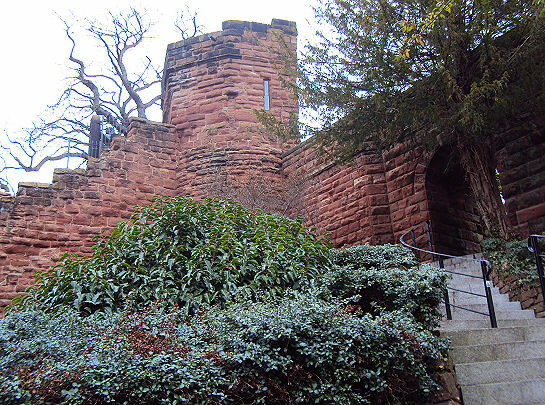 The rectangular shaped, weathered red sandstone tower stands on a tall plinth. Steps lead up from the walkway on the city walls to an arched doorway. On the opposite side another doorway leads on to the spur wall to the Water Tower. Inside the tower is a fireplace and a closed staircase which is lit by a single slit window. Bonewaldesthorne's Tower has been documented since 1249. It was either rebuilt or altered in 1322-26 when it became the gatehouse to the Water Tower. A close inspection will reveal musket ball holes dating from the time of the Civil War siege of Chester in 1645-46. The Chester Mechanics' Institution opened a museum inside the tower in 1838. It is now only open to the public for only a few days a year.